All Nippon Airways flight 692 in Takamatsu after smoke in the cockpit forced an emergency landing. 137 passengers were evacuated, 5 of whom were injured in the process (Credits: Reuters). On January 16, the US Federal Aviation Administration (FAA) grounded all Boeing 787 Dreamliner airplanes pending investigation into the safety of its batteries. Poland followed suit, quickly joined by the rest of Europe by decree of the European Aviation Safety Administration. Japan’s fleet had already been voluntarily suspended. India and Ethiopia joined the ban within hours. “Before further flight, operators of U.S.-registered, Boeing 787 aircraft must demonstrate to the Federal Aviation Administration (FAA) that the batteries are safe,” read the FAA’s emergency airworthiness directive in part. The move came after a series of incidents with the Dreamliner power source instigated fire-related hazards aboard the luxury jet. On January 7, a battery fire occurred in a Japan Airlines 787 while on the ground in Boston. On January 8, an inspection found a defective wire bundle connected to another 787 in Boston. On January 11, the FAA announced a safety review of the plane. 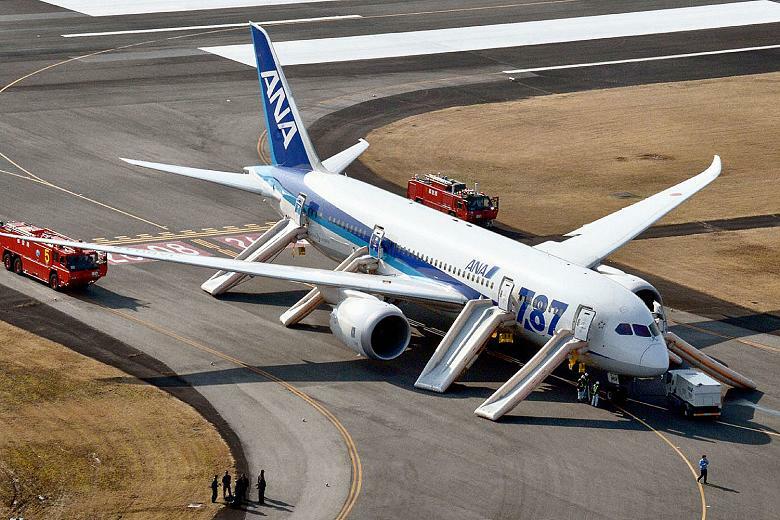 On January 16, an All Nippon Airways 787 made an emergency landing in Japan after a battery fire broke out mid-flight. A December 4th flight that made an emergency landing in New Orleans due to a fuel leak seems to be unrelated to the battery issue, but Boeing had a battery malfunction incident even earlier in a 2010 test flight of the vehicle. The incidents all stemmed from the battery pack in Dreamliner’s aft equipment bay used to start the auxiliary power unit. It is one of two Lithium ion batteries aboard each craft, the second serving as flight system backup and powering pilot displays. Each battery is about double the size of a typical car battery. The problems stem from the use of Lithium ion batteries, a battery chemistry first for aircraft. Lithium ion batteries have a high energy density and charge more quickly than other battery technologies, but that performance comes at a price. The batteries tend to be very sensitive to operating conditions and easily overheat or short out when overcharged or exposed to temperatures higher or lower than their design capabilities. This can result in fires and production of irritating and corrosive gas from the batteries’ electrolyte fluid. 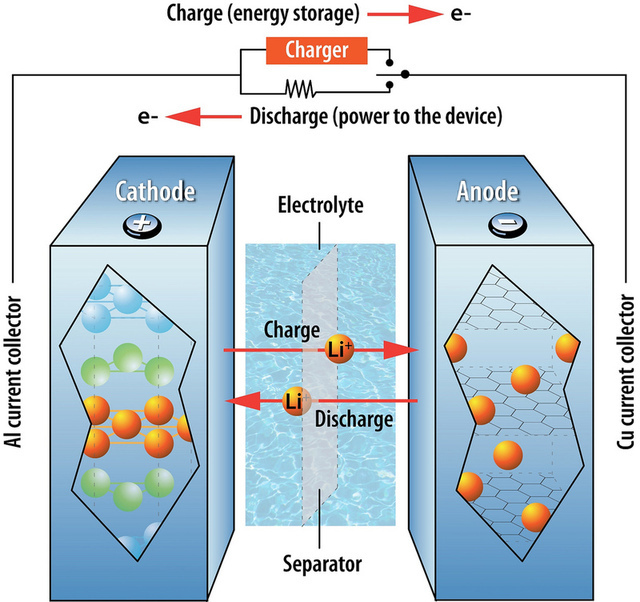 Basic operational concept of a Lithium ion battery (Credits: Argonne National Laboratory). Other industries went through growing pains with Lithium ion battery fires as well, with well publicized incidents with laptops and automobiles. Boeing was aware of the sensitivities of the technology from the beginning of its work on Dreamliner, and clearly thought they had built in sufficient precautions. The FAA’s initial flight approval of the plane specified Boeing’s responsibility for ensuring battery safety. Boeing is standing by their plane, at they should; recent history has shown that Lithium ion batteries can be made to perform safely. “We are confident the 787 is safe and we stand behind its overall integrity,” said Boeing Chairman, President, and CEO Jim McNerney in a statement following the global grounding of their plane. Now the question is, how quickly can they address the problem and what implications might it have for Lithium ion use in other applications. One of those applications that has been highlighted by the Dreamliner issue is the use of Lithium ion batteries in space, and particularly aboard the International Space Station. Boeing’s battery supplier, GS Yuasa Lithium Power, Inc. (GYLP), specializes in large format Lithium ion batteries for aerospace, defense, and commercial operations. In November 2012, GYLP was awarded a contract to provide such batteries for use in the ISS Electrical Power System as an upgrade to existing Nickel Hydrogen batteries. There are already Lithium ion batteries aboard ISS, such as those powering the station’s laptops. Some of those batteries are off the shelf variants, but, says Jeevarajan, “we stringently test all the batteries, especially the Lithium ion batteries.” Guidelines for use of Lithium ion batteries in space were issued by NASA in 2008. The technology is commonly used in satellites for its superior performance efficiency and longevity.